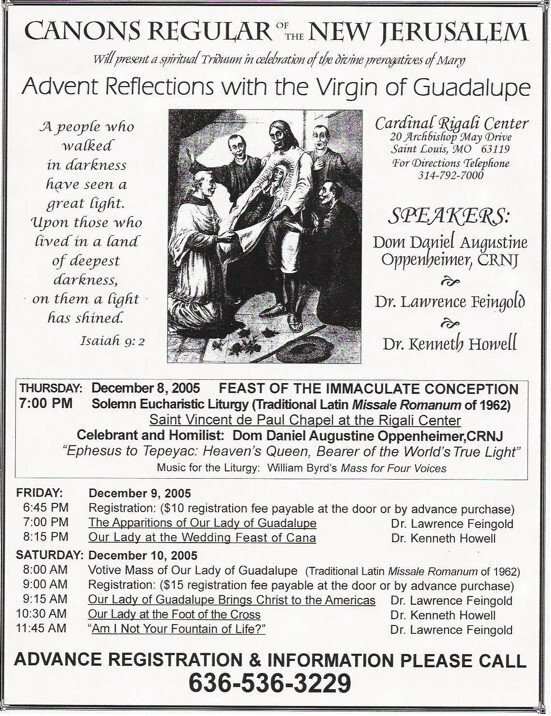 The Canons Regular of the New Jerusalem will host an Advent reflection on Our Lady of Guadalupe, from Thursday, December 8th, to Saturday, December 10th, 2005. This will be held at the Cardinal Rigali Pastoral Center in Shrewsbury, Missouri. The Canons Regular of the New Jerusalem is a clerical institute of consecrated life, living a semi-monastic life under the Rule of St. Augustine. They celebrate the Holy Mass and the Divine Office in Latin according to the liturgical norms of 1962. The Traditional Latin Mass will be celebrated at 7:00 p.m. on Thursday and at 8:00 a.m. on Saturday, by Dom Daniel Augustine Oppenheimer. Click on flyer for larger version. Dr. Kenneth J. Howell is Director and Senior Fellow of the John Henry Cardinal Newman Institute of Catholic Thought. He is also Adjunct Associate Professor in the Program for the Study of Religion in the University of Illinois. Dr. Howell studied theology at Westminster Theological Seminary where he concentrated in biblical languages and systematic theology. In 1978, he was ordained a Presbyterian minister and served parishes in Florida and Indiana. After completing his Ph.D. in linguistics at Indiana University, he taught Greek, Hebrew, and Latin at Reformed Theological Seminary in Jackson, Mississippi. His teaching duties involved theological research which led to his conversion to Catholicism in 1996. During this time, he obtained another Ph.D. in the history of Christianity and Science from the University of Lancaster (U.K). Dr. Howell is the author of four books and numerous articles. God's Two Books: Copernican Cosmology and Biblical Interpretation in Early Modern Science (University of Notre Dame Press, 2002) is a study of interpretative strategies employed in the emergence of Copernican cosmologies during the Scientific Revolution. Mary of Nazareth: Sign and Instrument of Christian Unity (Queenship Press, 1998) is a scriptural study of Marian doctrine. Meeting Mary Our Mother in Faith (Catholic Answers Press, 2003) is a popular explanation of Catholic beliefs about Mary. His fourth book on the Eucharist is due out from Catholic Answers soon. Dr. Lawrence Feingold is a theologian and specialist in the thought of St. Thomas Aquinas. In 1990, shortly after he and his wife converted to Catholicism, he began to study Philosophy and Theology at the Pontifical University of the Holy Cross in Rome, earning a doctorate in Dogmatic Theology with highest honors in 1999, with a dissertation on The Natural Desire to See God According to St. Thomas Aquinas and His Interpreters. For six years Dr. Feingold taught theology and philosophy to seminarians of the religious institute, Miles Christi, in Argentina. During that time he gave numerous conferences on theology and Catholic apologetics in the Detroit area. He recently moved to St. Louis, and is now employed in the philosophical and theological formation for the Canons Regular of the New Jerusalem. This fall the Canons Regular of the New Jerusalem have opened a philosophical institute for seminarian formation under Dr. Feingold’s direction. From I-44: Exit at Murdoch. 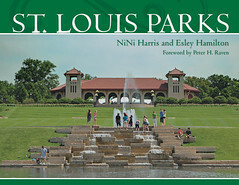 Go south on Laclede Station Rd. 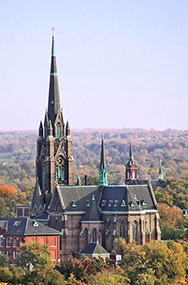 Cardinal Rigali Center is approx. 1.6 miles, on the left (immediately after Kenrick Manor Dr.). From I-40: Exit Hanley south. Go approx. 3.5 miles (street name changes to Laclede Station Rd. ); Cardinal Rigali Center is on the left (immediately after Kenrick Manor Dr.). From I-55: Take I-270 North to Tesson Ferry, approx. 2 miles. Go north on Tesson Ferry approx. 4 miles; Tesson Ferry changes to S. Rock Hill Rd. at Gravois. Go approx. 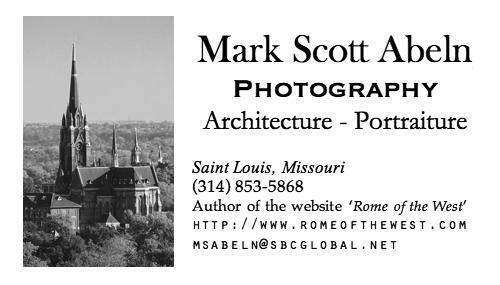 1 miles on S. Rock Hill; turn right onto Laclede Station Rd. Cardinal Rigali Center is ahead on right approx. 1.5 miles. Please register in advance to reserve a seat and to help us calculate attendance! Registration: $10 Friday, $15 Saturday. Credit cards accepted (although payment by check is preferred). Checks payable to the Canons Regular of the New Jerusalem.